First, decide what you want to set the option to, then use the following steps to change the setting, depending upon your platform. First, launch Whatsapp and then click on Menu in it. Commonly it’s a 3-dots symbol on the top right-corner and for those who have a menu button in the three capacitive button at the bottom can access it from there (usually bottom left-most or right-most touch capacitive button). See Also: How to generate Whatsapp Group Invite Link? First, launch Whatsapp and then tap on Settings in it, located at the bottom right corner. First, launch Whatsapp and then slide down from the top of the glass to reveal a gear-wheel-shaped Settings button. 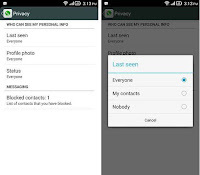 Tap on the Privacy Settings, and you can see the Last Seen option. Just tap on it and select whom do you want to show the information – Everyone (info will be visible to all), My contacts (Will not be visible to people other than WhatsApp contacts) and Nobody (No one can see the info and neither can you see their Last Seen info).